Two journalists release book on the NFL's alleged campaign to cover up potential dangers of concussions. Professional football, what has become america's sport. The show seems spectacular. The hits more violent than ever. Now the nfl must confront a most serious issue. The possible correlation between football and brain damage. Go award-winning journalists allege that the nfl waged a two decades long campaign to help cover up any potential link. They've written a book, called "league of denooil." They've produced a documentary for front line. Take a look. At what price glory. The hall of fame center mike webster died at the age of 50, after years of combat on the field. Reporter: Mike webster, one of the best to ever play his position, died in 2002 after suffering for years with dementia and depression. After his death, he would become the first nfl player diagnosed with the neurological diseased chronic traumatic encephalopathy. SINCE 2005, DR. ann McKee has studied the brains of 46 former nfl players. She spoke with the brothers and pbs's frontline about her findings. We have an enormously high hit rate. That would be extraordinary to pull in that many cases with any other disease that just were suspected. Think the incidents and prevalence have to be a lot higher than people realize. To her, it may the the beginnings of an epidemic. I think it will be a shockingly high percentage. I'm wondering where this stops. I'm wondering on some level if every single football layer doesn't have this. The numbers then and now, they are striking. There's 54 brains of former nfl players studied. Of those, 52 have been diagnosed with cte. Reporter: While the evidence is relatively new, the controversy is not. The league just settled a suit with former players agreeing to pay $765 million. Without admitting any liability. What did the league know, when did it know it, and to what extent did it try to bury science? Reporter: In 1994, paul tagliabue created a committee. That committee became the vehicle by which the nfl denied the significance of the issue for the next 16 years. Reporter: In 2007, a meeting in chicago, where new commissioner, roger goodell, spoke on the matter. Captured on tape in the new frontline document arydocumentary. The new evidence is that the doctors are making excellent decisions. It's proven by the research done that looks at that issue. The head of goodell's concussion committee took on the critics. Anecdotes do not make scientifically valid evidence. I'm man of science. I believe in empirically determined, scientifically valid data. He said there is no evidence that football players are at risk for cte. In my opinion, the only proof is in boxers and in some steeplechase jockeys. Reporter: In 2009, dr. Mckee was invited to speak. She's bringing pieces of brain into the nfl offices and having the committee look at the brains and examine them themselves. And they're just basically shredding her work, telling her she's wrong. Not really even considering it. Reporter: There's a comparison to the nfl to big tobacco. Why? The nfl creates this scientific body that would some what suggest in some ways they cherry pick data to cook the books on whether concussions are serious. And then there's a massive attack on those independent scientists suggesting clearly that there's a connection between football and long-term brain damage. Now in a statement to abc news, the nfl said it has made and I quote a pro found commitment to the health and safety of its players. And also, that and I quote, the results have been both meanleful and measurable. We will not waver in our long-term commit to a better and safer game at all levels. A discussion that has certainly just begun. 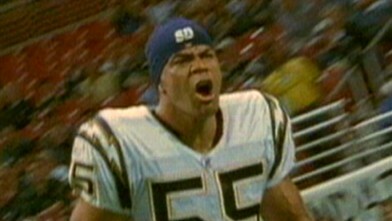 Did Football Kill Junior Seau? Doctors have concluded that concussion-triggered depression might have led Seau to take his own life. NFL stars speak out about the health risks of the game. Erin Andrews and Dr. Julian Bailes discuss football's dangerous "head shots." Now Playing: Did Football Kill Junior Seau? Now Playing: Is Football Too Dangerous?